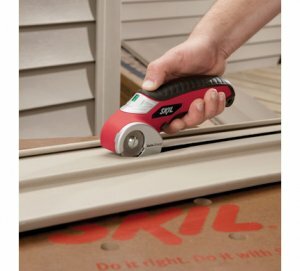 If you don't remember the Skil Cordless Power Cutter, it is a small 3.6 volt cordless circular saw that uses its spinning blade turning against a stationary blade to cut through all kinds of materials. Carpet, Plastic Packaging, Fabric, Leather, Paper, Cardboard, Vinyl Flooring, Wallpaper & more up to 1/4" thick don't stand a chance. You can get this Factory Reconditioned Skil Power Cutter from Amazon at a great price of only $29.95. Here is why you shouldn't be afraid of buying reconditioned tools. A Skil Certified Factory Reconditioned product has been through a complete inspection by factory trained technicians at the Skil National Reconditioning Center. Genuine factory replacement parts have been installed by the technicians as necessary. The reconditioned product is guaranteed to meet all original specifications and to perform as new. The item may have minor cosmetic blemishes. Each reconditioned item comes with a Certificate of Authenticity. Total customer satisfaction is backed up by a one year repair warranty by a nationwide network of factory and authorized service centers. Still not convinced? I just bought one of these a couple days ago, and when it arrives you can look forward to a full review. If you want me to test it on something in particular, let me know in the comments.